Let's go back to about four months ago. We're in my sister-in-laws living room, and as she is nursing her two month old daughter, I start chatting with her as I tap my finger tips on my seven months pregnant belly. We were having some little momma moments while my 3 year old niece was running circles around my husband in the next room. And this is where the conversation began. WHICH BABY CARRIER WAS THE BEST ON THE MARKET? She had just been gifted an Ergobaby which was leading in popularity, as far as we could tell, and I was trying to do some hands-on research with all of my friends’ and family’s carriers to decide which one I wanted to register for. So once my tiny niece was nice and full we both took turns marching her around the house in the Ergobaby. Fast forward two months and this time my sister-in-law was now in my living room and as I was nursing my two week old, she rocked her four month old and my 3 year old niece was running circles around my husband in the next room. :) By this time, I had just received a very generous gift from a CBS T.V. show, The Talk which included a BECO carrier. So once my tiny daughter was nice and full we both took turns marching her around the apartment in the BECO. Talk about déjà vu! So what did we decide? Which of these carriers was superior? Was it Ergobaby or BECO? Well let's just see how this “Battle of the Baby Carriers” plays out. What I can tell you, is the results were absolutely unanimous! Before we get into the specifics of each of the lines, let’s chat about the benefits of baby wearing. 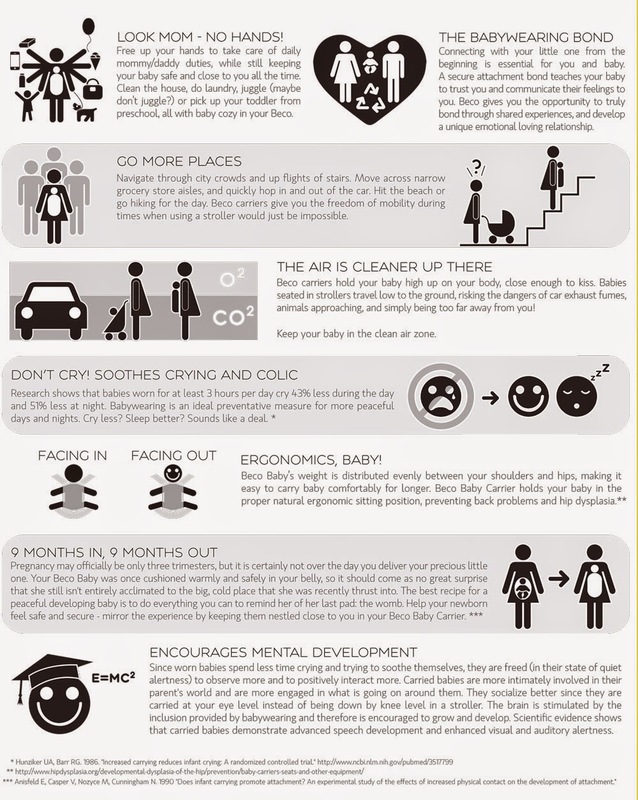 This image from the BECO website represents 7 advantages to baby wearing. Baby Wearing allows mom to be hand’s free. It also facilitates healthy attachment. A baby carrier lifts the baby close enough for kisses, opposed to being much lower in a stroller. In some ways baby wearing simulates the womb. Baby wearing leads to calmer babies who snooze more. Now that the benefits are established, let’s get into the comparisons! Expandable built-in waist pocket & built in key ring. Padded shoulder straps that are worn straight like a back pack. Equipped with chest strap. Adjustable ergonomic seat from wide base to narrow base to transfer baby’s weight efficiently between carry positions. Keeps babies knees even to or above hips, with baby’s spine in curved “c” position. Cradles baby in a natural siting position with the wide, deep seat. Sleeping hood supports baby’s head while sleeping, plus adds protection from sun and privacy while nursing. Built-in padded headrest with ability to attach Soleil hood. Extendable back panel can be adjusted depending on position to provide extra head neck, and back support for baby. Distributes baby’s weight evenly across hips & shoulders Baby’s weight leans towards parent’s center of gravity making her/him feel lighter. On paper the options are fairly identical. One thing I find particular interesting is Ergobaby’s newest carrier, the 360, is incredibly similar to BECO’s first carrier, the Gemini. Likewise, BECO’s newest carrier, the Soleil, is incredibly similar to Ergobaby’s first carrier, the Original. If you opt to go with a four position carrier, you can save up to $68 by going with BECO because the Gemini does not require an infant insert. If you opt for a three position carrier you can save up to $25 by going with Ergobaby. Another noteworthy comparison is that you have to prioritize what is more important to you: the fourth position of front carry facing out or the storage, because in both brands one is sacrificed for the other. In fact my Sister-in-law loved my BECO so much, she even returned her Ergobaby at a loss in order to purchase a used BECO! I personally opted for the Gemini because I like the idea of showing Little B the world on our many fun walks to come. We have to wait until she no longer depends on assisted neck support, but in a few months she will be able to interact with her environment while being worn! Yay, Congrats BECO!! !